For a very limited time, our office is offering 2 boxes of Latisse for just $99.00. We have a very limited supply, so if you are interested in taking advantage of this amazing promotion, please stop by our office today or call us so that we can mail yours to you! 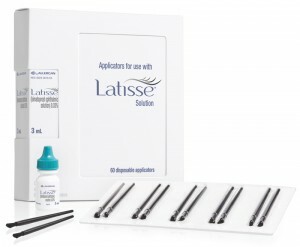 Latisse solution is a prescription strength liquid that is applied to the eyelashes nightly used to grow eyelashes, making them longer, thicker and darker. The onset of Latisse is gradual, but the typical person sees a significant change in eyelashes within 2 months. Latisse has been approved by the FDA and no longer requires a prescription written by your doctor. Latisse is easy to apply. Once nightly, remove applicator from it’s tray. Then, holding the sterile applicator horizontally, place one drop of Latisse solution on the area of the applicator closes to the tip but not on the tip. Then draw the applicator carefully across the skin of the upper eyelid margin at the base of the eyelashes (where the eyelashes meet the skin). Dispose of the applicator after one use. For additional questions, please call our office and speak with a member of our staff. They’d be happy to answer all of your questions regarding Latisse.